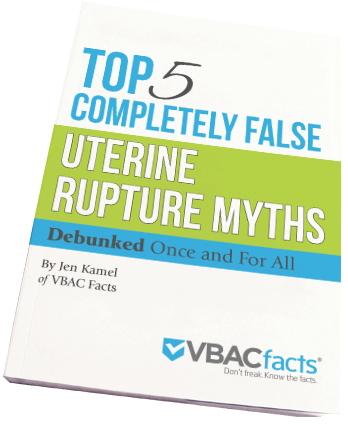 I’ve written before about the symptoms of uterine rupture as well as how having an epidural does not interfere with the diagnosis of uterine rupture. One uterine rupture symptom that some parents – and professionals – are surprised to learn about is shoulder pain. How can an uterine rupture cause shoulder pain? Internal bleeding from uterine rupture can cause referred pain through the phrenic nerve which can present in the shoulder. Shoulder pain is sometimes not included in lists of uterine rupture symptoms, but I have seen it cited multiple places (see below) and have had conversations with OBs, nurses, and anesthesiologists who have experienced uterine ruptures with shoulder pain. I’m also aware of two cases where the uterine rupture diagnosis was delayed because staff was not familiar with the incidence of referred pain. Anyone who works with birthing women should be aware of the symptoms of uterine rupture including referred pain. Please note that not every uterine rupture causes shoulder pain and not all shoulder pain is a symptom of uterine rupture. If you want to get clear on the evidence and politics surround VBAC, check out my online training “The Truth About VBAC.” I offer versions for parents and professionals. Learn more here. The following quotes addressing shoulder pain & uterine rupture are from case studies and textbooks. How to I get access to current articles? I have pain in behind my shoulder the doctor sent me for a routine blood test which came back slightly anemic, the doctor has referred me to the Hospital for cameras back and front, I am 71 years old very fit BP perfect weight perfect stools perfect, could a slight bleed in my shoulder be the cause? Lots of things can cause shoulder pain. This article is talking about one cause among someone who is pregnant. Please follow up with your physician to identify the cause of your pain. I hope it resolves soon! Do you when the shoulder pain begins? I am 19 weeks and I have been having shoulder pains could this be a sign I shouldn’t vba3c or is this normal to have shoulder pain. If you have concern over any pain you are experiencing, I encourage you to contact your doctor or midwife.